Construction Operations Building Information Exchange | BSRIA Blog - Opinions and insights from BSRIA Limited. BSRIA has just launched its latest guidance on the Soft Landings graduated handover process. How to Procure Soft Landings – guidance for clients, consultants and contractors is designed to help clients and their professional and building teams frame their Soft Landings requirements in a consistent and structured manner. The guide is a response to two clear trends in the use of Soft Landings. Primarily, clients aren’t sure what they are asking for when they call for it in tenders. Construction firms are seeing wide differences in client requirements. The initiated clients may spell it out, but for every expert client there are 20 who simply ask for Soft Landings without a clear idea of what it is. Many builders and contractors, particularly those not up with current thinking, are similarly clueless on how best to respond. That’s one of the downsides with an open-source protocol – the viral spread of Soft Landings is a good thing, but a lack of certification and control means that the uninitiated can easily catch a cold. Second, Soft Landings is being adopted by central government as a formal procurement policy. This is Government Soft Landings (otherwise known as GSL), a Cabinet Office-inspired interpretation of Soft Landings for government clients. While it’s not a million miles away from the official version published by BSRIA and the Usable Buildings Trust, GSL takes a more facilities management perspective of the process and focusses far more on getting guaranteed outcomes from the construction industry. GSL is slated to be mandated for central government projects in 2016, along with the adoption of Building Information Modelling (BIM), with which Soft Landings is well-suited. So what we have, then, are commercial clients still a little confused in their (voluntary) adoption of Soft Landings. On top of that is an incoming group of government clients, building anything from schools to prisons to aircraft hangers, for whom Soft Landings is a huge unknown but who will be mandated to adopt it. BSRIA’s view is that it might be a good idea to lay out the best ways of expressing Soft Landings in client requirements, pre-qualification questionnaires, and invitations to tender, so that the clients and industry alike get greater consistency in Soft Landings projects from the very outset. The procurement guide has benefited substantially from the Soft Landings User Group, a BSRIA-run team of clients, architects, consultants and contractors who have learnt from experience on Soft Landings projects what works well and what doesn’t. This learning has been used to create practical, generic requirements for Soft Landings activities that can be used in project documentation. A body like the User Group is absolutely vital for the practical development of Soft Landings. BSRIA knows it doesn’t have all the answers, and in any case should not dictate how Soft Landings is put into operation on real projects. Each project has its own needs and objectives, and each form of procurement throws up its own set of opportunities and challenges. The trick is to find out what works in each context, and try and find ways round thorny issues like novation and cost-cutting for instance, both of which can compromise the best of intentions. The guide provides specifically-worded requirements for each step in each of the five stages of Soft Landings. The guidance is split into three sections, with requirements worded for clients appointing professional designers, clients appointing main contractors/builders, and contractors appointing sub-contractors. Inevitably, there is some repetition, but the guide gets round that at relevant points by referring the reader to sections in the guide where a specific requirement is more logically located. The example shown is typical. Energy metering installations are proving to be a major problem – they are installed to satisfy Building Regulations, but are often not set up in a way that makes them useful. 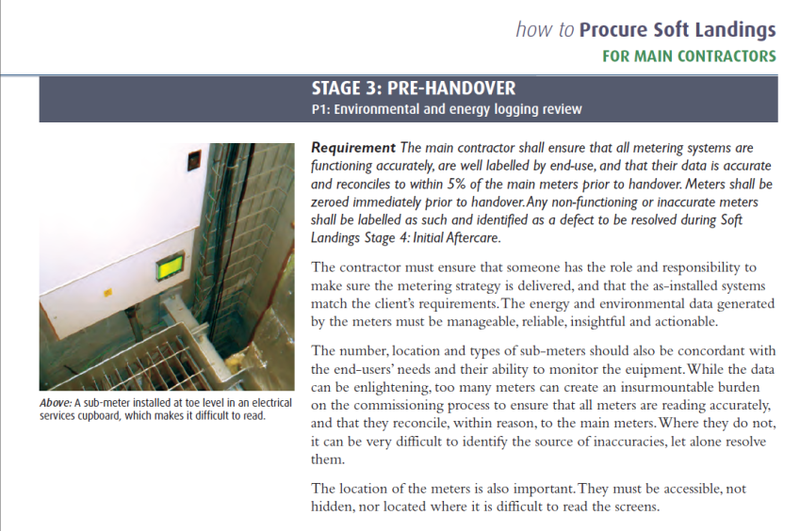 Although the Soft Landings Framework calls for an energy metering strategy, the procurement guide goes a step further by spelling out what should be provided, in this case at the pre-handover stage. Each requirement is supported by explanatory text that gives the main contractor, in this instance, some background context and the reasons for the requirement. Some Soft Landings stages may have more than one worded requirement. Some optional requirements have also been provided, for instance in the aftercare stages where it may be important to spell out precisely who should be involved and for how long. For example, under the core requirements for main contractors appointing sub-contractors, contractors have the option of requiring a subcontractor to be retained to assist the client and other members of the project team during handover, and afterwards to monitor the building’s performance. Some sub-contractors may be required to be based on site full-time during the initial aftercare period to assist with end-user queries and to undertake fine-tuning of systems. This would not typically apply to a ductwork sub-contractor, but it would usually apply to a controls sub-contractor. More critically, it could apply to any contractor whose systems or components come with automatic controls, particularly those with bespoke communication protocols (seemly most of them) which can only be adjusted by the supplier after payment of a fat call-out fee. If you’re nodding at this point, you know how it is. 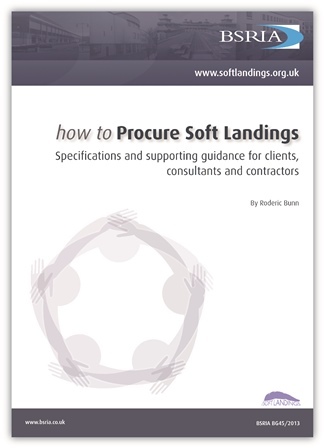 The Soft Landings procurement guide now covers this issue, and many others like it. An opportunity has been taken to fill gaps in the Soft Landings Framework, published back in 2009 when practical experience was a bit thin on the ground. For example, the guide contains a generic design work stage which was not included in the Framework. The procurement guide also provides more detailed advice on principles of procurement and tendering, how to include Soft Landings in tender processes and interviews, and some advice on the best way to budget for Soft Landings. The timing of the guidance also coincided fortuitously with the publication of the 2013 RIBA Plan of Work, which gave BSRIA the opportunity to align Soft Landings stages against the new RIBA stages, and those published by the CIC. There’s also a public sector Soft Landings decision tree included to help government and local authority clients dovetail their procurement requirements with Soft Landings requirements. Building performance research is identifying many critical aspects of procurement where clients and the construction industry need to tighten up their respective acts. The commissioning manager is a critical role, and the earlier they can be appointed the better. The procurement guide offers some advice on how to do this, and what their role should be in Soft Landings. Soft Landings is not job in itself but a set of roles and responsibilities shared among the client and project team. However, on large jobs particularly a co-ordinator may be needed to make sure the administration is carried out. Paperwork – which could include updating operational risk registers in BIM models for example – needs to be done by someone. If this isn’t covered, Soft Landings might fail ‘for want of a nail’. BSRIA hopes that How to Procure Soft Landings – guidance for clients, consultants and contractors will provide all that clients and project teams need to put Soft Landings into operation. It is a practical guide to accompany the Soft Landings Framework – still the industry bible on what Soft Landings is about, and why you should adopt it. With all this talk about the performance gap between design and building operation, we mustn’t lose sight of the fact that the act of procuring a building and constructing it is a team enterprise. No-one goes into the process with the intention of doing a bad job. Events, like many things in life, can conspire against it. What Soft Landings tries to do is provide toeholds for everyone involved to do a better job in the face of budgetary, time and skills pressures. How to Procure Soft Landings – guidance for clients, consultants and contractors provides a whole load more toeholds for everyone. BSRIA BG45/2013 How to Procure Soft Landings – guidance for clients, consultants and contractors is available from BSRIA bookshop.